and eternity for an hour. 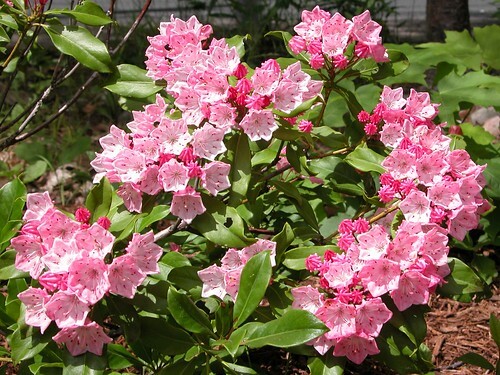 Several years ago, we planted three mountain laurel along the edge of our driveway. The plan was, these shrubs would eventually grow large enough to provide a sense of privacy from the street and we'd remove the string of shabby pines currently serving that purpose. The snow was deep and the plow pushed it far off the driveway (in preparation for pushing yet more snow off the driveway after the next storm.) Alas, the plow was an instrument of carnage on the bushes. One was torn from the frozen ground, it's broken limbs entombed in a wall of snow. The others fared only a little better. I now make a point of chatting with the plow guy at the start of each winter to remind him that our driveway is large and I really don't care if he scrapes every square inch of it clean. And I'd really appreciate it if he didn't crush the mountain laurel. TLC not withstanding, they still look pretty spindly. Robust is not a word that springs to mind. I was therefore delighted when they showed signs of blossoms this spring. For the first time ever, they're flowering. In fact, they're dripping with blossoms. Beautiful pictures. 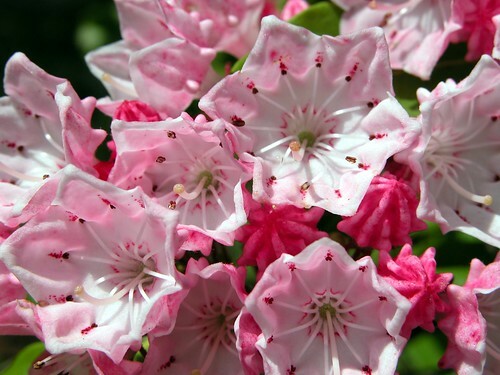 I've never seen Mountain Laurel before, but now that I have, I'll have to get some. It's gorgeous! Sorry to hear about the snow plow incident. Another great reason why I'm happy I live in the South. But before you move here, remember that we have to deal with having clay instead of dirt in our grounds. Not too great for planting flowers.